After concerns were brought up by Municipal District of Taber council around dryland cultivation being converted to irrigation, more information was brought forward for further discussion. The issue was originally brought up during the M.D.’s regular meeting on Dec. 11 and was supposed to be on the agenda at the next regular meeting on Jan. 8 but the needed information was not available yet. Due to this, council called a special meeting to discuss the item on Dec. 14 with one portion of it being open to the public and the other being in closed session. With Bow River Irrigation District expanding by 35,000 acres in the new year, administration started to explore opportunities to generate additional revenues through converting dryland to irrigation. With a deadline to apply on Jan. 16 and 25,000 acres available for new development on dryland quarters, councillors needed to decide if they wanted to move forward. “I looked at our inventory of lands to determine which would be most suitable to convert and came up with approximately 17 quarter sections, mostly on the criteria of location to the irrigation source. I didn’t look at 15 kilometres away from a pipeline or canal as it wouldn’t be feasible,” explained Brian Peers, director of municipal lands and leases, though Peers stated there would actually be 18 quarter sections. The lands in question are primarily located in the Retlaw area and all M.D. owned land. Administration contacted all leaseholders to determine the level of interest in converting which saw six out of eight expressing enthusiasm while the other two were somewhat interested. While the contact was made, administration saw the responses to be theoretical due to a lack of available details. One of those details was soil testing which is needed for all quarter sections to determine suitability for irrigation and would be the first step if council elected to pursue the conversion. “Given the timeline on this and when to get irrigation on the land, it is very tight as far as getting water in 2019,” added Peers. As far as rent, the M.D. estimates it to be around $200 per acre overall if the development of the complete irrigation system was at their cost. If leaseholders were expected to cost share in the development, rent would approximately be $150 per acre. Higher rents may be achievable if subletting was permitted by the M.D. with annual rental revenue would range from $331,500 to $422,000, dependent on how lease terms were specified. The complete cost of irrigation development on 17 quarters would approximately be $8,247,500 with a portion of the capital expenditure possibly coming from the leaseholder, according to the M.D., though they don’t expect all 17 to be developed. “I think we have to be flexible in how we do this. There is going to be some who are very motivated to proceed with this and probably front a lot of the cost and there may be others, because of their circumstance, that it wouldn’t make sense for them. There could be a potential to have the leases structured in different ways to accommodate individual circumstances,” continued Peers. Concerns expressed by leaseholders have been around rent increases and lease contract lengths, both of which council were aware of. With one of the leaseholders in attendance for the open session, he was able to express how important the lease was to his operation. “It’s land that we have had since 1959, we built our farm around that. We can’t afford to buy it and the next sense is you can’t afford to lose it either,” said David Geremia. Harris explained the M.D. was open to exploring a variety of options with leaseholders if they were wanting to convert. Geremia asked about the possibility of having the M.D. buy the water rate with the farmers building the infrastructure, which council acknowledged as a possibility. While soil testing may prohibit some lands from converting, Coun. John Turcato also pointed out some of them may have tough geography to navigate which would also hinder the conversion. With subletting an option M.D. council was okay with, they also wanted to make sure there were some guidelines in place in case leaseholders went down that road. Others councillors agreed a rotation would have to be approved if subletting was going to be used. Transferring the land between family members was also something council wanted to focus on. “My thought is, I want to ensure the leaseholders that they can transfer to an arms-length member of their family,” added Miyanaga. While the process has been started by the M.D., a lot of questions still remained for both leaseholders and everyone at the M.D. “I think right now, they (leaseholders) have more questions then we have answers for,” stated Coun. Brian Brewin. There still was some concerns about going forward from council as the projected cost was around $8.2 million. With funds coming from debentures over an estimated 20-year term, a concern brought forward was whether the project would be worth it. “If it is going to take us close to 20 years to pay for it, that seems like a long time for a return on investment. Heaven forbid, if we try to auction everything off like the BRID did, it means we have to break leases and I don’t want to see that. On top of that, to do anything with our land is a pretty big deal and it is all of the resident’s land too. There are only seven of us and I feel more residents should have a say in what they would like us to do. This is a big decision and shouldn’t be rushed,” said Coun. Leavitt Howg. Upon the approval, a $100 non-refundable deposit would be required within six weeks of the notification, though council could decide to not pursue the conversion in those six weeks. Turcato was also in favour of getting more public opinion on whether they should move forward. Other councillors also expressed their opinions that a public consultation would be a good idea. 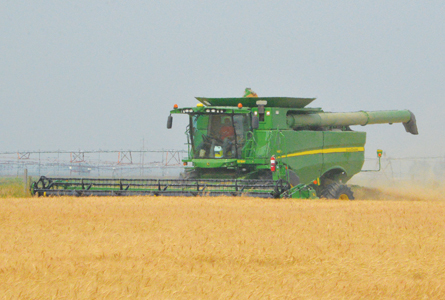 With the six week period to decide if they want to move forward, Reeve Harris saw it was a good opportunity to explore the possibilities the added acres would provide. “I look at it this way, on an individual farm basis, the fact they have over 25,000 acres applied for worth of dryland irrigation, it is important to them out there and they are at least looking at it. They have the same six weeks to decide if they are going to do it,” he said. Heading into closed session, council needed to decide if they wanted to apply for the BRID acres. Based on unapproved minutes from the special meeting, council made three resolutions to apply for water rights to the BRID on 18 quarter sections on M.D. owned land, all of which were carried. The first was a resolution for water rights for 13 dryland quarter sections, the second was for tame grass water rights on four quarter sections and the final was a water rights application for one-quarter section. Council made a motion to advertise the M.D. has applied for water rights on the website and media sites which were carried. They also made a motion to request the director of municipal lands and leases to determine costs pertaining to irrigation development and provide financial information to council pertaining to total costs per quarter and debenture information and was carried by council.